What is College Loan Consolidation? Many people who become personal trainers fund their college education via federal student loans. The cost of 4 years at a university can vary but you will obtain multiple loans which cover your tuition as well as living expenses. Since you take out multiple loans from different federal and private organizations you will have multiple payments when you graduate. Student loans generally have a low interest rate but there are companies who consolidate all of your student loans into one big loan which is called a consolidation loan. Student consolidation loans have a fixed interest rate. Your rate will not change through the duration of the loan. Every year there is a new interest rate established for federal consolidation. The rate goes up and down from year to year. You will always get letters in the snail mail telling you about new low rates. Pay attention to the different rates because a small percentage can mean thousands of dollars over the duration of the loan. Any Tips about College Loan Consolidation ? If you think about the future it will be to your advantage to pay off your student loans and consolidations as soon as possible. The monthly payments are low for a reason, First, many people cannot afford a high college loan payment when fresh out of college. Once most people exit college and enter the “real world” the last expense they want to spend a large amount of cash on is a student loan. 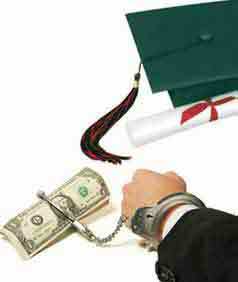 Secondly the college loan consolidation companies are out to make a profit. The average student consolidation loan will make thousands or even tens of thousands of dollars in interest over the duration of the loan. Since the duration of the loan is usually 10, 15, 20-30 years the small monthly payment will cost you thousands of dollars over the years you pay it off. The obvious reason most people get the loan is because they can’t afford to pay it off completely. Many people simply don’t want to pay off the loan early. It is up to you, but if you think 10 years down the road it will be very smart to pay off your college loan consolidation as soon as possible. If you can hold off on that new car, or all those adult toys with your freshly increasing income you will save possibly tens of thousands of dollars. A good personal trainer in a major city can easily net over $10,000 a month. Parlay your earnings minus expenses for a few months and you may be able to pay off your student loans and never look back. It will be painful to spend so much money but it is well worth it. If you are a personal trainer who has a college degree or two and are paying on your college loan consolidation think this over for a few minutes. College loan consolidation payments are like a monkey (albeit very small monkey) on your back which will not leave for 20 years or so. What are the College Options for Personal Trainers? Find the right place to start or finish any college degree for personal trainers. Should Future Trainers Utilize College Loans? If you have no time to travel to campus because you are a full time personal trainer an online college degree is perfect for you. Learn the necessary steps for starting a career as a personal trainer from someone who has been through it all, college, loans, loan consolidation, personal training certifications and continuing education courses.